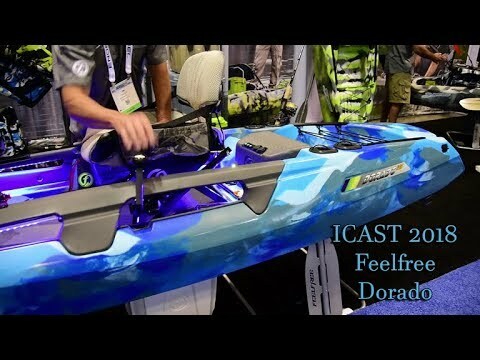 The Dorado is Feelfree's newest Overdrive Pedal Powered kayak with features unlike any other including the fully integrated electrical system with navigation and cockpit LED lights and ready for the optional Motordrive options, fish finder and more. The kayak is designed from the ground up with a focus on stability, tracking and propulsion made possible by the innovative cathedral tri-hull. The cathedral tri-hull features two outer pontoons along with a central pontoon with deep channels in between giving way to optimal on the water performance. The Dorado's open platform is designed with the angler in mind...wide open, gear ready and accessible with unlimited outfitting options utilizing Feelfree's Uni-Track system. On deck, you'll find the upgraded removable multi-height adjustable Gravity Seat with the High Back, for all day paddling and pedal comfort. The kayak also comes with a variety of unique patented comfort features seen on the Lure series including the removable multi-height adjustable High Back Gravity Seat, Wheel in the Keel and sturdy molded in handles. Whether you choose to paddle, pedal with the Overdrive or power it up with the optional Motordrive (sold separately), the Dorado will extend your time on the water with the best in stability, performance and comfort. This kayak was designed for the serious angler, the one who leads the pack well before sunrise and isn't phased by the sunset - the Dorado is Kayak Fishing 2.0! The Dorado Overdrive Kayak Features an integrated Overdrive, Stern Navigational Lights, a Bow Storage Area w/Bungee System & Transducer Hole, a Cathedral Hull design that is Fast, Stable & has Optimal Tracking, Oversized Bow Electronics and Storage Console, Rod Tip Holders, FeelFree's Patented Adjustable High Back Gravity Seat, Raised Blow Molded Gunwale Rails, Bow Uni-Track Rail System, Gunwale Storage Areas, Intuitive "8 Ball" Steering, Integrated Oversized Rudder- Patented High Back Gravity Seat with Forward/Backward Adjuster- Prewired Electronics System, Dedicated Utility Battery Box w/Wiring System and AUX Port (Requires 12v Battery), Four Flush Mounted Rod Holders, Cockpit Lights, Oversized Stern Tankwell w/Bungee System, Stern Uni-Track Rail System, Stern Light, Patented Keel in the Wheel, Molded in Kayak Handles. Needless to say. This kayak in feature rich! Q: Does the Dorado have clips someplace for a paddle? A: Hey there, we appreciate the question! No, the Dorado 125 will not come with paddle clips. A: The motor has to be purchased separate from the Overdrive Pedal Drive. Q: Do you know if the pedal drive can be removed and replaced with the standard console from the lures for days you don't want it in the way? A: According to Feelfree the pedal drive can be replaced with the standard console. Q: Will the Dorado come with scuppers ? A: I believe that it will come with scupper plugs, but we will not be able to answer that for sure until these actually ship to us and we can see them in person. Q: Can I buy direct from the Factory? A: FeelFree does not sell kayaks directly from their factory, and unfortunately these still have not been released yet. Q: I live in Arkansas just east of Little rock. Where is your close it dealer located. A: Our closest ACK retail store will be our store in Spring (North Houston), TX. I would recommend going to feelfreeus.com to see if they have a dealer closer to you. A: No, this will not come without the overdrive system. A: These will get to us and delivered in September. Q: Will a dash board go on this wth a peddle drive? A: Since we have not gotten any Dorado's in yet, it is hard to say for sure. If I had to guess, it looks like you should be able to use a dashboard up past the pedal system area though. Q: Is the battery integrated into the insert for motor power? How long does it take to charge? Is it possible to take a spare and switch out batteries or do you need to buy two entire units? Nice looking boat. When will you have one in the shop to look at? A: Being that this kayak is on pre-order, we have not gotten our hands on them quite yet, so I can't quite comment on charge time or battery design. We are hoping to have them in stock in our stores by the end of July! A: Thanks for your question! We are preparing for delivery in June. Q: Is this the price with the motor drive ? If not what is the price for the motor drive ? A: We appreciate the question! This is the price with the Overdrive Pedal Drive included. Q: Do you have the dorado in winter camo in stock? If so how can you purchase with affirm? Also does the rudder and overdrive come pre-installed? A: We do not have any instock, this is strictly a pre-order. Right now, it has a tentative release date in the beginning of June, but that is subject to change based on Feel Free. I believe it will come pre-installed with those items, but it is hard to say until we actually get these kayaks in!